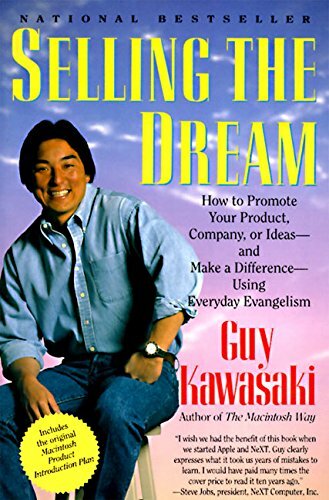 Guy’s success at Apple and as a start-up entrepreneur was the result of an innovative approach to sales, marketing, and management called evangelism. Evangelism means convincing people to believe in your product or ideas as much as you do, by using fervor, zeal, guts, and cunning to mobilize your customers and staff into becoming as passionate about a cause as you are. Selling the Dream is a handbook and workbook for putting evangelism into action. Kawasaki charts a complete blueprint for the beginning evangelist that covers such topics as how to define a cause (whether it is a business, like Windham Hill Records or the Body Shop, or a public interest concern, like the National Audubon Society or Mothers Against Drunk Driving), how to identify good and bad enemies, how to deliver an effective presentation, and how to find, train, and recruit new evangelists. One of the highlights of the book is a short course in developing an evangelistic business plan, illustrated by the complete, original Macintosh Product Introduction Plan. Selling the Dream will teach you how to become a raging, inexorable thunder lizard of an evangelist — a leader whose words will never fall on deaf ears again.